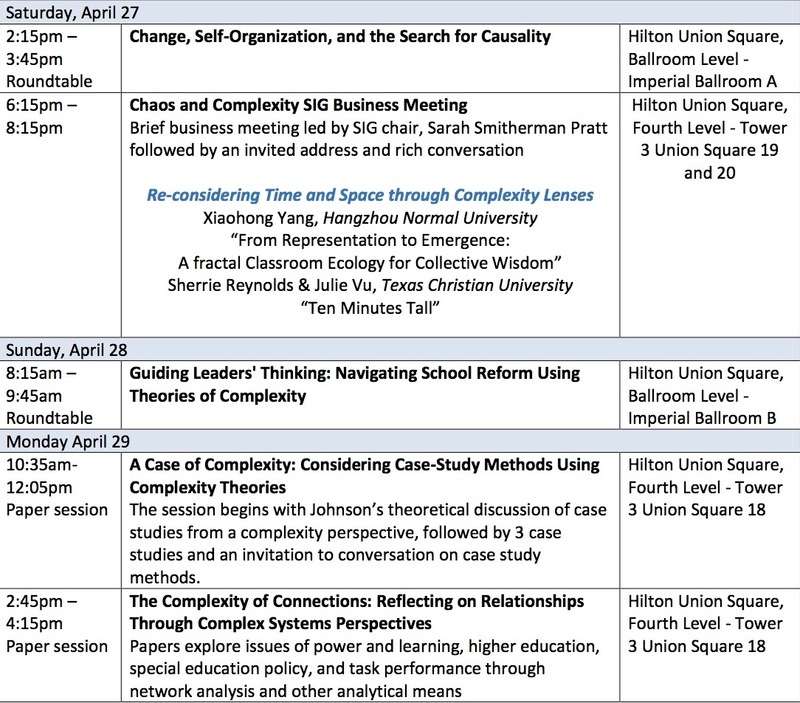 Welcome to the Chaos & Complexity Theories in Education Site! We are in the process of updating this site to make it more current and applicable to you. Our new webmaster is Dr. Emma Bullock, Assistant Professor at Sam Houston State University. If you have any announcement of interest to this group, we invite you to send it to Dr. Bullock at ude.ushs|kcollube#ude.ushs|kcollube. We are particularly interested in showcasing recent research projects and publications relevant to this group. Every day we face bright ideals for education in a foreground often standing against a somewhat darker background where there seems a resurgence in closed and linear system thinking in an education ecosystem that is in quite an unsteady (state) ;-). 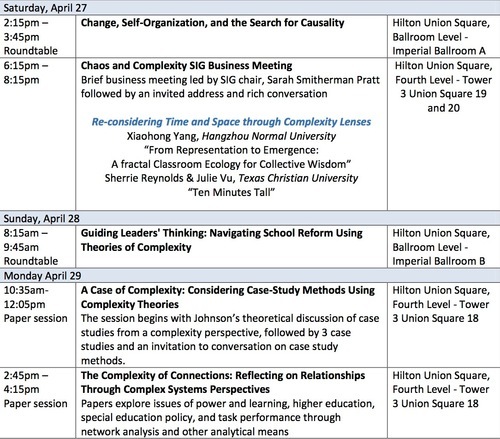 Chaos and complexity thinkers can and must help solve the complex problems emerging in education, Your colleagues (and some exciting new ones), would appreciate your important voice back at our important AERA SIG17 table to re-vision the conversation. Let’s grow together at AERA SIG 317to learn and share ideas as we reshape SIG 17 - with you. We respect, we remember and we miss your important ideas if you are a former member of our SIG (Chaos & Complexity Theory). I am writing to ask you to continue your membership in AERA and in our Chaos and Complexity SIG (#17) for the remainder of 2018 and for 2019. AERA has announced a Special Offer where you pay for two months of 2018 AERA membership (see below). As an added incentive, you will receive a free 2018 SIG membership and you will be given both electronic access and be mailed all issues of your journal of choice plus Educational Researcher back to January 2018. We hope you name our SIG as your 2018 SIG membership. All AERA Benefits for 2018 will start immediately and continue through December 31, 2019. We hope you rejoin our SIG at the 2019 AERA Annual Meeting in Toronto, Canada on April 5 – 9. The registration fee is deeply discounted for members. To rejoin, click here to login. If you do not remember your user name or password when you are at the login page, select “Forgot your user name” or “Forgot your password” and an email will be sent to you with a link to reset. If you prefer to rejoin by mail or phone, please contact the AERA membership team at ten.area|srebmem#ten.area|srebmem or (202) 238-3200. I hope you take advantage of this offer and help our SIG be stronger with your membership and engagement. Anyone who is interested in gathering for dinner after the Business Meeting on Thursday, April 3 is welcome. Anyone who is interested in gathering for dinner after the Business Meeting is welcome (immediately following the meeting on Saturday, April 27). This year we will be going to First Crush (http://www.firstcrush.com; 101 Cyril Magnin, San Francisco, CA). The reservation has been made for 15 people so please let an officer know if you intend to join. Thanks! Greetings on the new year! As the chair of the AERA SIG: Chaos and Complexity Theories, I want to thank you for visiting this site. Our SIG members are interested in inviting more colleagues to participate in conversations around nonlinear dynamics and education research. We chose a wiki for our group's web site so that all who join the site can add, edit and update our ongoing conversations. I hope you will sign up so you may become an active participant in these virtual conversations. We hope to see you in Vancouver for the AERA Annual Meeting. As soon as the sessions are announced, we will post them on our site. It is shaping up to be another fantastic year of conversations full thought-provoking questions and ideas! I look forward to our interactions and conversations as we engage in the work of complexity and education. As we make preparations for AERA 2012, please take a look at the information provided by AERA: http://aera.net/Default.aspx?id=13332#Information. In particular, don't forget to bring your passport! Also, contact your cell phone carrier prior to traveling if you wish to use your phone while in Vancouver. Some of the SIG officers are investigating Wi-Fi access for the conference, and we will share that information as it becomes available. AERA 2011 has come to an end. Please post your papers here (under the menu item: "Papers and Presentations"). Photos from the conference and Bill Doll's 80th birthday party will be posted shortly. If you have photos, please post your's, as well. And, HAPPY BIRTHDAY and Best Wishes to Bill Doll! We look forward to seeing you at AERA 2012 in Vancouver. A little video of SIG members and friends returning to their hotels after Bill Doll's 80th birthday party. An Ecology of Mind -- A Daughter's Portrait of Gregory Bateson is now available on on Amazon. 3/8/2011 — New issue (Volume 8, Issue 1) of Complicity: An International Journal of Complexity and Education is now available online. Sarah Smitherman Pratt has been elected chair of our SIG for a three-year term starting in 2011 - congratulations Sarah! Create your own"Member's Page" with information on your background and interests. Great for networking and more…. Help develop "Our Intellectual Genealogy" page. Add news and other items to "What's New? ", "What's Cool? ", and "What's Funny?" pages. Advertise (for free) in our "Academic Personals" section. Add your papers to our "Papers and Presentations" section and publish a critique, commentary, or other article in our "Critiques and Commentaries" section or any of the "Thematic Sections." Ask for help with research topics. Add entries or add to entries in our "Glossary" section. Write an article about relevant and useful research methodologies in our "Research Methodologies" section. Provide information on research ideas that have been on the back-burner and that you can put out there for others to use. Graduate students can add articles and materials to the "Student Section." Add videos, photos, and other multimedia products to that section. Add links and information on other resources to our "Resources and Links" section. Start and participate in forum topics.